Digital cameras can't really handle Day-Glo. I tried. The text: electric typewriter and Letraset titles. "Amazon Mutual Wants You!" Volume One, from Dragon Tree Press, is the most interesting and creative of my three old-school pickups (previously, previously). The concept driving this anthology is very 1982. It's that era in which the first flush of playing D&D straight had faded out, and the kind of self-aware narratives seen in Dave Trampier's "Wormy" comic were taking hold. So, the party are meta-adventurers, having been hired by a guild (the titular Amazon Mutual) to carry out the corpse retrieval clause on other adventurers' insurance policies. The four adventures are four such missions, each with a different author and a markedly different style. Some of the guild rules are typical AD&D fun-crusher magical fiats. Retrieval teams are geased ("absolutely no save!") not to steal the victims' possessions. Body bags of holding eliminate the problem of lugging corpses back. There are half a dozen better ways to approach the first problem, ways that open the slim possibility of hoodwinking the guild -- Amazon keeps a list of possessions and recovery teams are held liable for missing stuff; an annoying familiar chaperones the rescue effort; and so on. The body bags solve a problem that's nonexistent if the party eliminates all opposition before retrieving the corpses, and kill an element of challenge that should hang over the adventure if they don't. The book's approach to what we would now call challenge ratings, though, is one of the dead-end gems of the Typewriter Era, up there with the Midkemia attack matrix. This manifest also includes suggested experience awards for outwitting monsters, dealing with traps, and finding clues and other plot goals. Given the slow advancement pace of by-the-book AD&D this is absolutely key. There's also a section where it's explicitly recognized that the character power level appropriate for each adventure depends on what approach the players and DM take. So, one adventure is suitable for level 7-9 if the DM plays it as a standard fighting room-crawl, 14-18 (!) if the DM treats it as an organized fortress where all the denizens can be warned in a short time, or much lower levels if the players choose to take on the adventure with sneaking, diplomacy, or infiltration. Temple of the Four Gods. 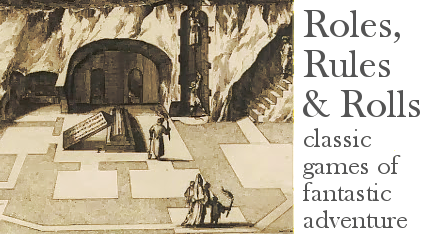 The first adventure takes you to retrieve four adventurer bodies from a temple with a prosaic layout, short on monsters and long on tricks and traps. There are a few clues explaining how the temple went over from the four gods to the service of Loki, but overall this is a funhouse mini-dungeon with a few random gleams of dark humor. Two corpses can be had almost immediately without any fight, one comes after a four-goblin battle, and it's only the last body that forces the players past a meaningful number of tricks and traps. Would run: 3/10. Stronghold of the Mer-Witch. An underwater cave mission to retrieve two adventurers. One is dead and can be found almost immediately after a nasty fight with a gigantic eel. The other is alive but a captive of the mer-witch deeper in, who commands a small army of mer-orcs and (not very tough) sea trolls, and can throw three death spells a day among other powers. A coral golem and an interestingly furnished underwater torture chamber liven up the otherwise unremarkable, "storehouse, barracks, kitchen" design. Would run: 6/10. Mission to Danger. The gonzo spirit of early-days roleplaying lives here. 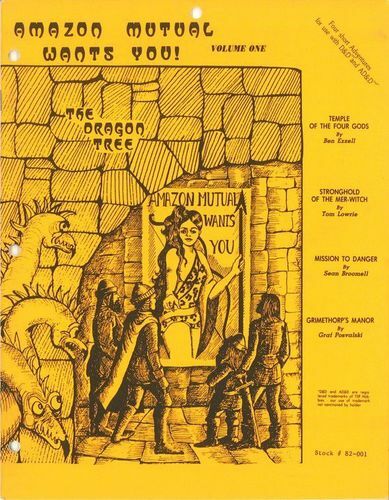 The person to be rescued, captive but not yet dead, is a "Hobbit Fighter-Techno" with a pistol, a switchblade, and a deadman switch, for he has mined the dark elves' dungeon fortress to blow sky-high! The DM is asked to play out the ticking clock in four hours of real time. Some nice situations can happen: meeting an illusionist cat who might help with infiltration, a possible fight between an enemy red dragon and a captured rainbow dragon, finding out the hobbit is an ornery and contrary ally, and a treasure hoard that turns into a river of molten gold if the explosives blow. Would run: 8/10. Grimethorp's Manor. This adventure plays around with the Amazon Mutual premise. The party has to retrieve a peacefully deceased retired adventurer from his mansion, following the letter of his policy, but his ghost doesn't want his body moved. It's a clever concept but the execution is lacking. Until the party finds the body, they will be walking through the mansion rooms with nothing interesting to do. When they try to take the body out, the ghost starts interfering, casting nuisance spells and animating the house's furnishings to attack, just to frighten and annoy but not cause harm. That's also not going to work. You frighten D&D players by taking huge chunks of hit points, and making them roll save-or-die, not by having a rug say "boooo". Would not run as is, and the adventure needs a lot of editing to work; I'd start by having bandit squatters and other random ruin pests in the mansion to give the adventure a real first act, make the ghost's attacks really dangerous, and on top of that have the rest of the bandits coming home from a raid just as the party is making to leave.